Comms Dealer magazine was the first publication for the UK convergence channel and remains the industry’s leading information resource for the comms and convergence channel community. With its professional team of journalists and channel specialists Comms Dealer keeps its readers fully updated on the latest news and developments in the ICT channel, highlighting and examining new channel opportunities and enabling technologies as well reporting on exciting new market trends. On the Comms Dealer website you will find the most up-to-date news, as it happens and more of it, along with a comprehensive offering of news and views, interviews, market analysis and insightful features, plus much more topical and real-time info at your fingertips. This site also offers users an enhanced search engine to access our database of almost 20,000 channel news stories and features together with the facility to easily share content via social media. 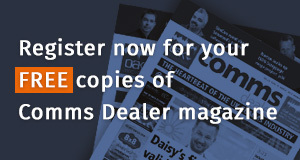 To keep up to date with the latest channel developments, register here to receive Comms Dealer magazine and weekly news bulletins and follow us on Twitter for breaking news updates. Comms Dealer magazine also organise a range of events which bring the channel community together including industry awards schemes and marketing leading networking events and conferences.